Phenomenal cosmic power! Itty bitty living space. Black holes, the cosmic objects with gravity so strong that not even light can escape, are believed to be at the center of most large galaxies. Likewise, the size of a black hole was thought to be proportional in some capacity to the size of its host galaxy. Until now, that is. A recent observation of galaxy NGC 1277, some 220 million light years away, has shaken up this belief by hosting a super massive black hole in a relatively tiny galaxy. Our own Milky Way galaxy is four times larger than NGC 1277, but the black hole at our distant neighbor's center is some 4,000 times larger than our own central black hole, and approximately 17 billion times the mass of our Sun. Ponder that one for a moment. Given that their intense gravity doesn't allow light to escape, it is profoundly difficult to actually observe a black hole, so we are forced to derive information about them by measuring their influence on nearby stars. Scientists hunting for the universe's largest black hole found NGC 1277 and estimated that its central black hole was roughly the size of our entire solar system, and made up some 14% of the mass of the entire galaxy. 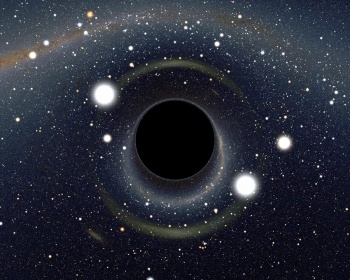 Until now, the prevailing thought was that such large black holes could only exist in larger galaxies, due to the theory of how they evolve in tandem with their host galaxy. Since black holes were thought to grow primarily by absorbing matter from their surroundings, it made sense that you would need a fairly high-mass galaxy to grow a super massive black hole. It is currently unclear how, exactly, a black hole this size formed within such a small galaxy, but scientists are already no doubt hard at work coming up with a viable explanation. "This galaxy seems to be very old," Dr. Van den Bosch told BBC, "So somehow this black hole grew very quickly a long time ago, but since then that galaxy has been sitting there not forming any new stars or anything else."